Redco™ Polycarbonate is easily worked, molded, and thermoformed; as such, polycarbonate is very widely used in modern manufacturing. Features such as temperature resistance, impact resistance and optical properties make Redco™ Polycarbonate the perfect choice for industrial and commercial applications. Redco™ Polycarbonate is virtually indestructible and much stronger than glass or acrylic. Multi-wall polycarbonate is inexpensive and has an insulation value similar to insulated glass. Polycarbonate diffuses the light and is very easy to install. Carports, Roof Glazing, Skylights, Drink Dispensers, Sound Barriers, Light Fixtures, Machine Guards, Roof Coverings, Police Riot Sheilds, Visors, Signs, Displays, Greenhouses, Swimming Pool Enclosures, Covers for Public Areas, Entrance Awnings, Patio Roofs, Balcony Enclosures, Windows…etc. Redco™ Polycarbonate sheet is exceptionally resistant to weathering. Redco™ Polycarbonate sheet is manufactured with an integral layer protecting the sheet from the damaging effects of sunlight. It will remain clear and non-yellowing for many years with minimal deterioration. Light transmittance for clear Redco™ Polycarbonate sheet–the most important criterion for growers–remains at 90% even through accelerated Q.U.V. tests. Redco™ Polycarbonate sheet is grower friendly. While it transmits a high portion of visible light, it is essentially opaque to ultraviolet light at wave lengths below 385 nanometers. Redco™ Polycarbonate sheet blocks out the harmful UV light. Redco™ Polycarbonate sheet transmits visible light as well as glass, providing an optimal growing environment. Up to 90% of visible light (as measured by ASTM standards )is transmitted through clear Redco™ Polycarbonate sheet to your crop. With 20 times the impact resistance of fiberglass and over 40 times the impact resistance of glass, Redco™ Polycarbonate sheet resists hail, wind and vandalism. At a thickness of .033″, Redco™ Polycarbonate sheet can withstand over 240 inch-pounds of impact. This equates to a 3/4″ hailstone falling at 96 miles per hour! Redco™ Polycarbonate sheet maintains this superior impact resistance at temperatures ranging from -40°F to 250°F. Redco™ Polycarbonate sheet can help save energy because of its thermal insulating capability. Compared to fiberglass, which has a U value of 1.56, Redco™ Polycarbonate sheet insulates with a U value of 1.2. Redco™ Polycarbonate sheet is unharmed by many chemical substances, but it is important to avoid contact with adhesives, paints or solvents which are incompatible with polycarbonate. Chemicals to avoid include benzene, gasoline, acetone, and carbon tetrachloride, among others. Only recommended cleaners should be used to clean Redco™ Polycarbonate sheet. Redco™ Polycarbonate sheet meets the requirements of an approved light-transmitting plastic as described by all three model building codes (ICBO, BOCA and SBCCI). These include ASTM D 635, D 1929 and D 2843. Redco™ Polycarbonate sheet exhibits superior flammability performance when compared to typical fiber reinforced polyester (FRP) and acrylic sheet materials. Redco™ Polycarbonate sheet reduces labor costs because its light weight simplifies handling, transportation and installation particularly of long spans in high places. Redco™ Polycarbonate sheet is only one-quarter the weight of greenhouse glass on a square-foot basis. 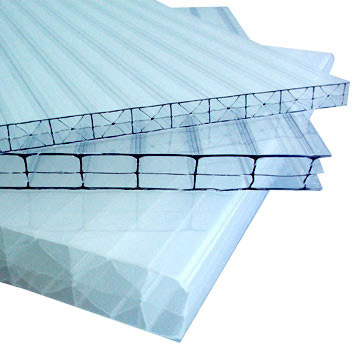 Redco™ Polycarbonate sheet can be used on both gable and quonset-style greenhouses. 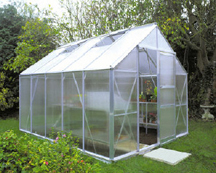 Easy-to-install panels can be attached directly to the greenhouse frame using one of the recommended fastener methods.